My parents first introduced me to sweet potato fries, knowing that I never did care for sweet potatoes unless they had sugar in them. I ended up enjoying them so much that I prefer them to regular fries now and regularly serve them with my meals at home for my family. Of course, I still like a little something sweet to go with them. 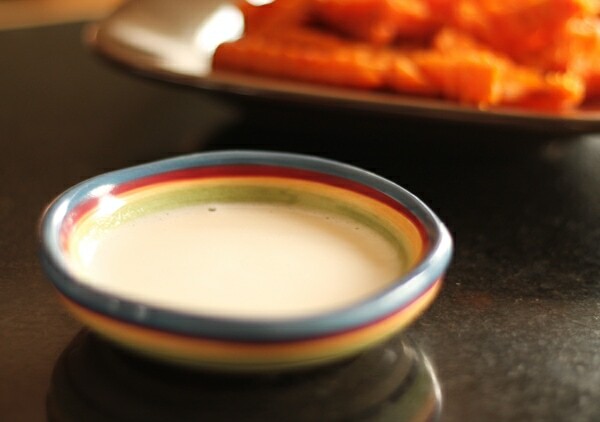 This marshmallow dip complements them wonderfully, plus it doesn’t take very long at all to make. For the sweet potatoes I prefer purchasing McCain’s Sweet Potato Fries. They are quick and easy to bake, and turn out much crispier than the ones I try to make at home myself. 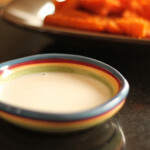 I like my sweet potato fries with a little crisp to them so I can drag them through that sticky marshmallow dip! Yum! McCain has three different sweet potatoes variations: Crinkle Cut, Sweet and Spicy, or Cross Trax (which we like to call Waffle Fries in the Midwest). My personal favorite are the crinkle cut. I like to add a bit of salt and pepper to them before I serve them. They also have other types of potato products such as Beer Batter Fries, Seasoned Spirals, Wedges, and more. My husband is very much a “meat and potatoes” type of guy, so we usually serve some form of potato alongside our nightly meal. They are extremely convenient when we are grilling burgers. Add 1/3 cup heavy whipping cream into a glass bowl and add 1/2 bag of marshmallows on top. Remove and stir with whisk. Place mixture back in the microwave for 15 seconds, removing to whisk again. Repeat this process until all of the marshmallows have melted and you have a nice consistency. McCain potatoes make a great side dish for everyday family meals, or even quick holiday meal preparation. To learn more about them, please visit them on Facebook. Would you like to try McCain potatoes? 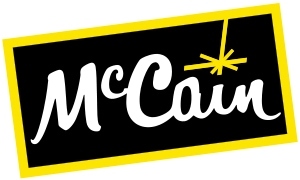 2 Midwestern Moms readers will have the chance to win 5 Coupons for McCain Potatoes products! This giveaway is open to US only and closes at 11:50pm EST on November 28th, 2012. To enter, please visit McCain’s Recipe Page and leave me a comment teling me what recipe you might like to create with McCain Foods.